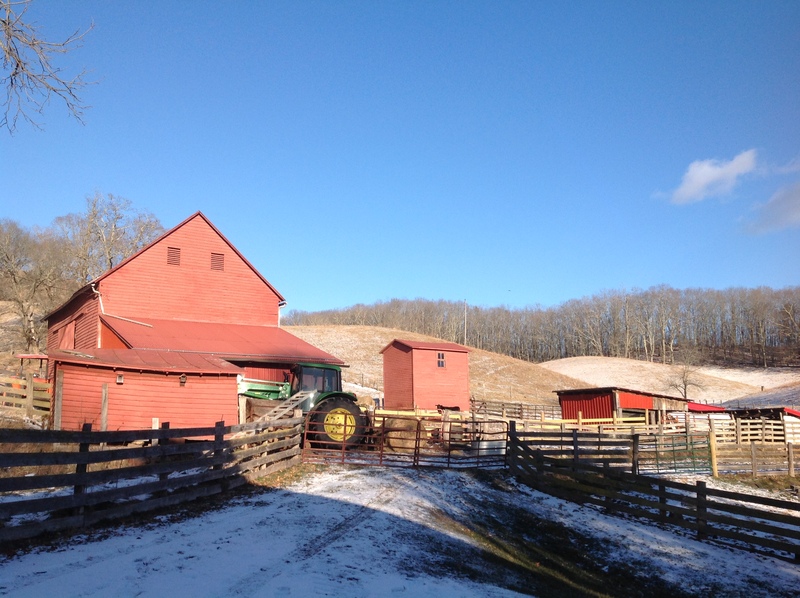 View from apple orchard to old barn (center) at the Big Meadow. 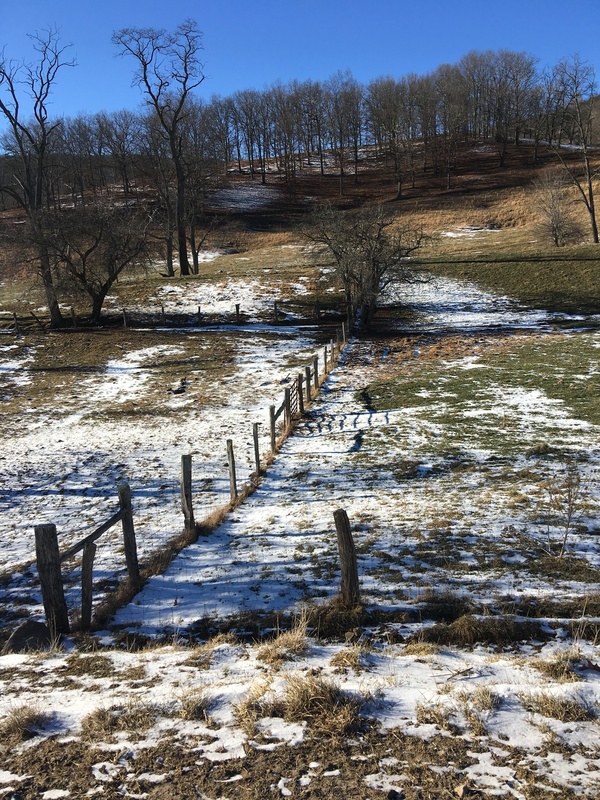 This, the old locust grove, is where the cows prefer their hay. The little barn is more visible. cows, uncovers grass still green. Yesterday Mike and I had a talk about the cows’ preference for the locust grove this time of year. He is surprised they are not out in full sun on these cold days and observes that this is their favorite spot. They are reluctant to move around when he delivers hay elsewhere, which is fine with him because when he leaves hay near the barn, they stomp around and unplug the automatic timer to his tractor. Which is not good, because then on these cold mornings, some below zero, he can’t get the tractor started. (The timer activates the heating of the engine oil so it is not too sludgy on a bitter cold morning.) He thinks the cows prefer the locust grove because it is their shady home place of summer. Tractor ready to distribute hay bales for the next feeding. Cows have memories he says. When it is time for a twice-bred cow to go into the barn to calve, he just opens the door and she heads straight into the stall she had the year before. If there is a cow in there already, there is sure to be a terrible fight. On the other hand, getting first-time mothers into the barn presents a problem. 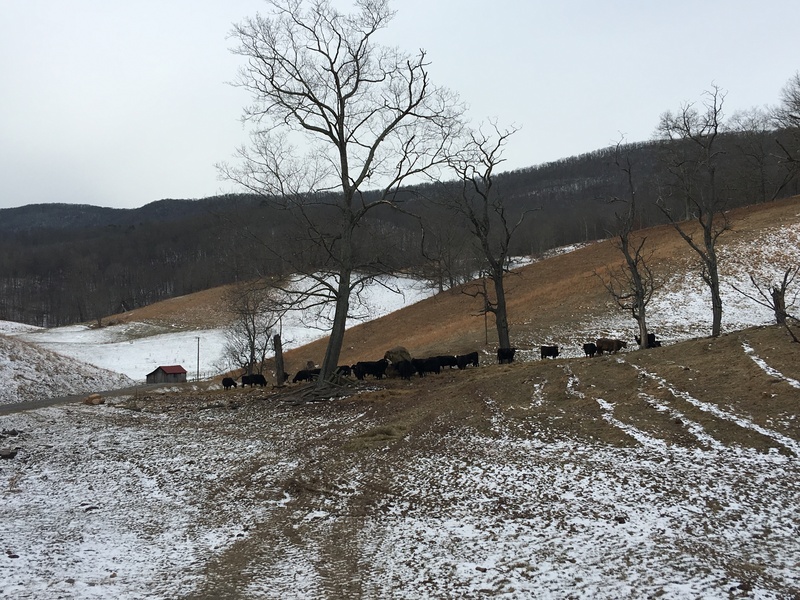 Mike has tender feelings for his cows in the winter when he is out feeding no matter the weather and his bad knee. Cows can withstand the cold if all their several stomachs are full. The gut bacteria create a literal fire in the belly. It’s freezing rain that causes Mike to tighten his lips and shake his head about the suffering of domesticated animals. On a clear day when the sun reflects off a layer of snow, it’s hard to notice anything but a beautiful dazzle. Looking south to Stark’s Ridge. Farms have a lot of fences and gates that create intersecting shadows. Because of some construction going on at the old house, there is provisional wire fencing adding to the complexity of the design above. The fence in the center divides the orchard (very few trees left) from the orchard meadow. A few small sinkholes are visible in the ground that rises to the hillside. On a day when the sun is wan, the colors of a winter landscape become subtle. I notice the soft brown of frozen mud, the pale russet of dried sage grass, and snow poked through with a thousand blades of grass. Tree branches are witchy, twitchy, sometimes ungainly, and always beautiful against the sky. The side of Stark’s Ridge with tree branches against a wan sky. I walk around the farm looking at everything, trying to understand placement of objects, natural and unnatural, how a landscape becomes what it is. 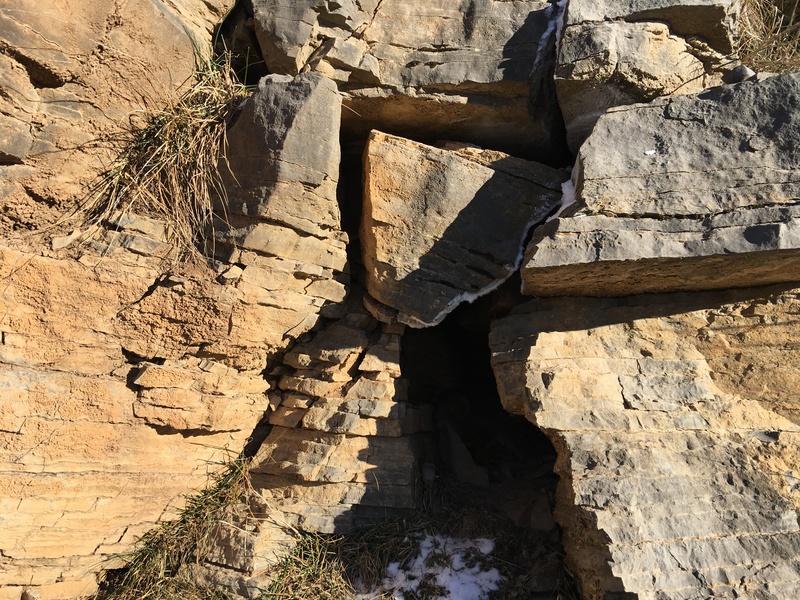 Layers of limestone that have heaved and broken apart provide dens for foxes. 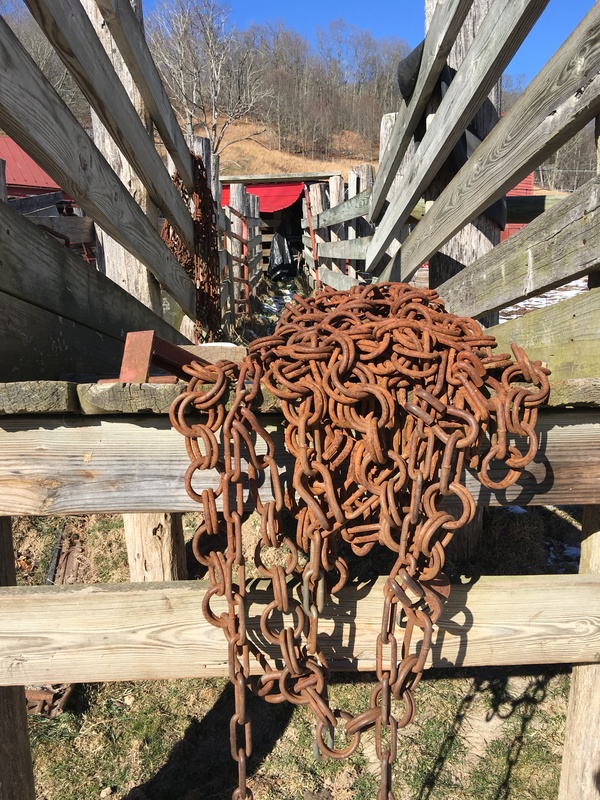 A cattle chute with rusty chains. Maybe I have a memory like the cow going into the stall where she has been before. Since brought home to the farm at birth, I always return, amazed at how much more there is to see and think about. When I visit Roy, my neighbor, who will be 94 on January 24 of this new year, we deconstruct the history of the hollow, no moment or detail too small for discussion. He lives alone with his cat Big Red, who for the first time deigned to sit in my lap before jumping, somewhat gracefully for a big cat, from the kitchen counter to a perch on top of the refrigerator. Mike checks on Roy every morning and the driver of the woman who cleans his trailer brings two apples each week for his old, long-legged donkey. Roy’s mailbox. The road at the upper right winds around to his home. Cow in front of the old barn seen from a distance in the first photo. Roy only needs one meal a day now he says–two fried eggs, two pieces of toast, a rasher of sausage, and a cup of coffee. He fixes it himself even though his hands are almost curled shut with arthritis. I took him two bite-size mincemeat pies made by my English friend who makes wonderful pie crust. That’ll be dinner he said as I set them by his easy chair. The thing I puzzle about is that Roy even in midwinter, when he can’t sit outside on the top step to his trailer, seems to know what is going on in the hollow. It’s as if he is now not bounded by walls and poor vision (he lost sight in one eye as a child) because he is so attuned to the hollow. “You should see Mike’s dog running after the tractor. Down the road and back up the road these cold mornings. You should see that,” he tells me. I have seen that but I wonder when he has. A paper wasp nest dangles from the copper beech branches in the foreground; Stark’s Ridge in the background. On the long drive from Ithaca to Mustoe, we listened to the audio version of La Belle Sauvage by Philip Pullman. 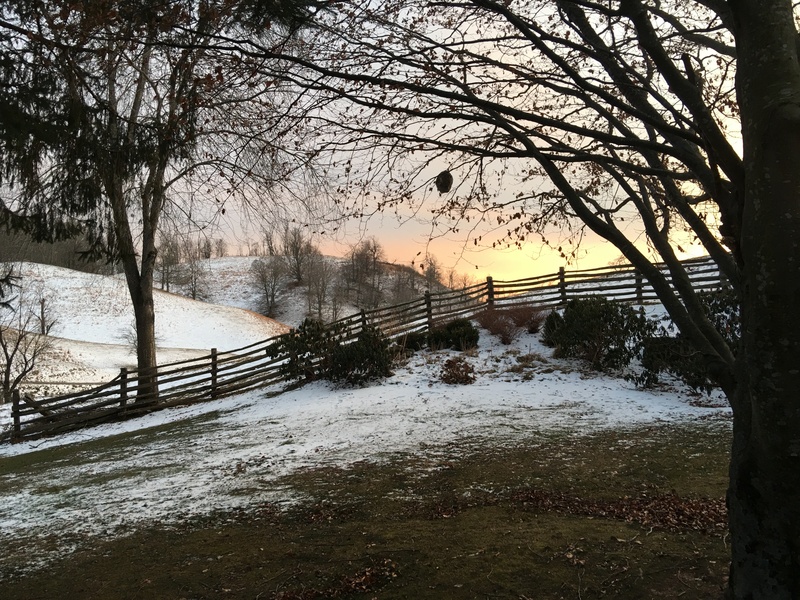 As a frontispiece he quotes a few lines from Irish poet Louis Macneice’s “Snow” , a poem about how much lays before our view– how “the world is suddener than we fancy it.” The hollow has always looked “sudden” to me. Now it’s time to say good-bye again; I have had my reset for the New Year!